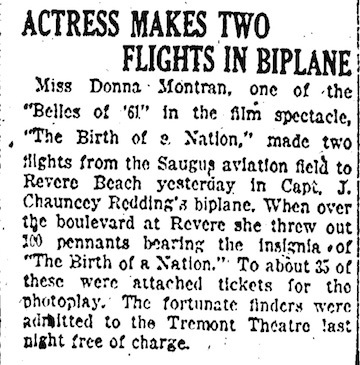 Miss Donna Montran, one of the pretty “belles of 1861” in “The Birth of a Nation,” at the Tremont Theatre, is anticipating the time of her life this afternoon, when she expects to make two round trips between Saugus and Boston Common with Capt J. Chauncey Redding in his biplane, incidentally showering “Birth of a Nation” pennants and free tickets for the Tremont Theatre on the heads of the crowd that will witness the flight from the Common. The two flights over the Common in the vicinity of the Tremont Theatre are scheduled, one for about 1:30, or not long after, the other a short time before the matinee performance is over, probably about 4:30. During the first flight the biplane will circle about above the State House dome. Miss Montran will be attired similarly to the lobby girls at the Tremont Theatre, though without the hoopskirt. She will drop 100 pennants on the Common, 25 of which will have tickets for the theatre attached to them. 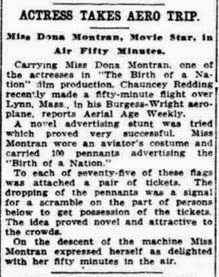 The distribution will take place during both flights, and those who capture the tickets will be able to see “The Birth of a Nation” free of cost. Sadly, she wasn’t able to make that flight. The theatre was unable to get approval for the flight over Boston Common and the State House. They did, however, get approval to drop the pennants over Revere Beach the following Day. This was a really big deal and the Boston Globe covered it with a photo article on July 23rd. There were articles in other papers including The Boston Herald, 23 July 1915. “Actress Make Two Flights in Biplane.” She flew in Capt. J. Chauncey Redding biplane on July 22nd. A google search for J. Chauncey Redding yielded a photo of the plane. The photo was taken the week of 6 September, just six weeks after Donna’s flights. If you wonder how dangerous was it to fly in a biplane in 1915, the pilot, Capt. J. Chauncey Redding, died on October 21st when his biplane collapsed while in midair while over the Lynn, MA, marshes. I was able to find Aerial Age Weekly on-line at Google Books. 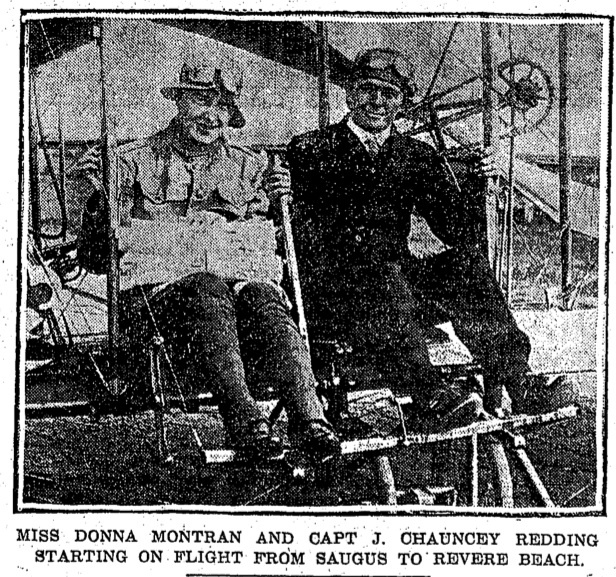 The Washington Herald article is a reprint of the same article and provides no additional information..
J. Chauncey Redding’s aeroplane on the beach, Week of 6 Sep, 1915. 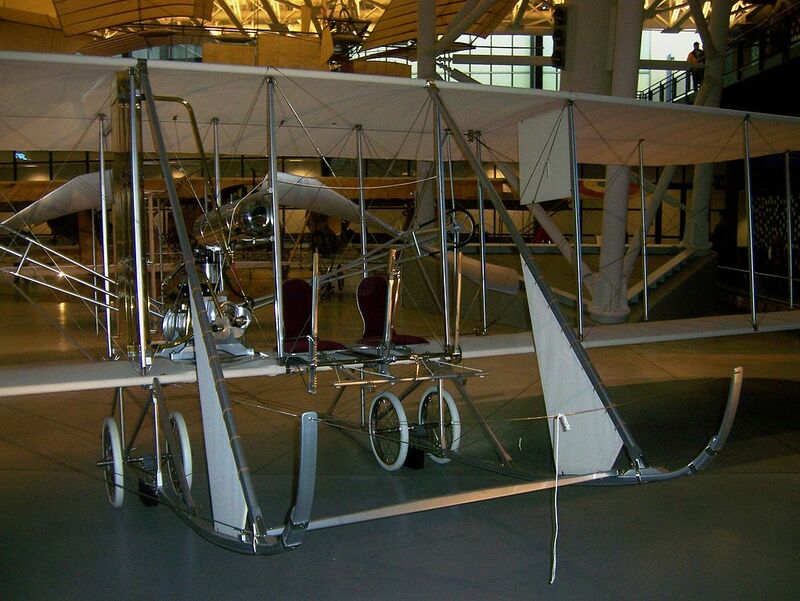 Finally, I was able to find a photo on Wikimedia photo of the Wright Model B which was licenced to Burgess to make the Burgess-Wright Model F. This was the exact type of aircraft J. Chauncey Redding used during Donna’s flight.